What began with four Saskatchewan women in November 2012 as a concern, then a title of a Facebook page and a Twitter hashtag, has become a worldwide movement in a matter of months. The collision of social media, indigenous environmental concerns and government deregulation legislation has created the Idle No More movement, the impact of which has not yet been fully realized. In response to bills C-38 and C-45, Jessica Gordon, Sylvia McAdam Saysewahum, Nina Wilson and Sheelah McLean created a forum to educate and discuss the Canadian government’s new legislation that would have a profound affect on the environment of Canada. Because the legislation affects almost all lakes and rivers, some situated on First Nation territories, the bills garnered the attention of all Ongwehonwe (Original People’s) communities across Turtle Island. And because Canada’s highest court’s direction to consult and accommodate with Ongwehonwe had been ignored, the voice of Idle No More grew to epic volumes once the call went out. The Ongwehonwe response to the Bills, which neglected treaty rights and any kind of consultation and accommodation, ignited Idle No More. 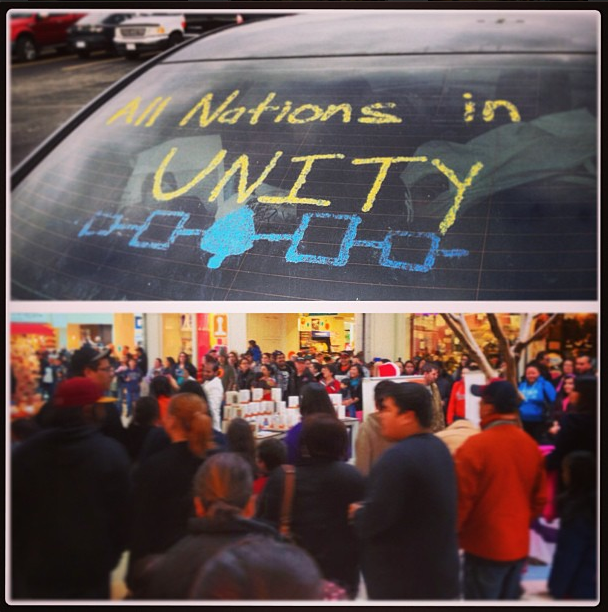 The grassroots movement danced its way into malls during December, the busiest holiday shopping time of the year. Chief Theresa Spence of Attiwapiskat announced on December 11 that she would embark on a hunger strike until the Prime Minister and Governor General agreed to meet with First Nation leadership. Although Chief Spence’s agenda focused on her own community’s issues, she too had issue with the impending Bills as they affected her people’s treaty rights. It took several weeks for mainstream media to focus their attention on the Idle No More movement. Television and local newspapers did not have it on their radar but Facebook pages and Twitter feeds were lighting up with references about where to join a flash mob and where the next march would be. After 18 days, I expected her to be physically weak. She was not. I could feel the strength of her spirit and conviction. And that same strength was felt in the camp and around the sacred fire where I sat and talked with people who had travelled there from other Native communities across Turtle Island to offer their support. The connection we felt with one another was instantaneous. No explanations were necessary. We had all experienced the legacy of residential school and its inter-generational impact. We had all experienced our rights being ignored. We had all experienced being Native in a dominant society. It is those adversities that bond us together. And it is that bond that has taken the smoldering of the Idle No More movement to the explosion that we see today. Anyone can join the Idle No More movement. If you drink water and want the lakes and rivers protected, this may be the movement for you. If you think the environment we live in is more important than plastic money, then research what this new legislation will mean for you. If you feel responsible to protect Mother Earth from any more destruction, lend your voice to Idle No More. Find out more information through their Facebook page. There have been questions asked from the public regarding who is the leader of Idle No More. The movement is truly a grassroots movement but founders have requested that all activities be peaceful and include Elders for guidance. It’s fitting that the movement was founded by women since in Haudenosaunee culture, it is the womens responsibility to take care of the land. If you ask me, there is a leader of the Idle No More movement and she is the matriarch of us all, Mother Earth.